The more I look at this, the more I realize that the Michael Young acquisition pushes Scott Van Slyke off the Dodgers’ potential postseason 25-man roster. Obviously, things can change on the fringes, and we’re going to knock on wood all month. But for the time being, here’s how it shapes up. Scoreless through six innings against hard-throwing righty Andrew Cashner, the Dodgers got RBI singles from Adrian Gonzalez in the seventh inning and Mark Ellis (off the bench) in the eighth to rally for a 2-1 victory, making them 50-13 since June 22. Los Angeles set a record for wins in a calendar month with 23. Presumably pitching for his spot in the rotation, Chris Capuano went seven innings, scattering seven hits besides a solo fourth-inning homer by Ronny Cedeno and walking only one while striking out seven. (It helped that Yasiel Puig threw out a runner at the plate.) Brian Wilson survived a threat in the eighth inning to get his first Dodger win, while Kenley Jansen struck out the side for his 23rd save. Five spots in the Dodger batting order had two hits: Gonzalez, Andre Ethier, Skip Schumacker, Juan Uribe and the pinch-hitting combo of Jerry Hairston Jr. and Mark Ellis. 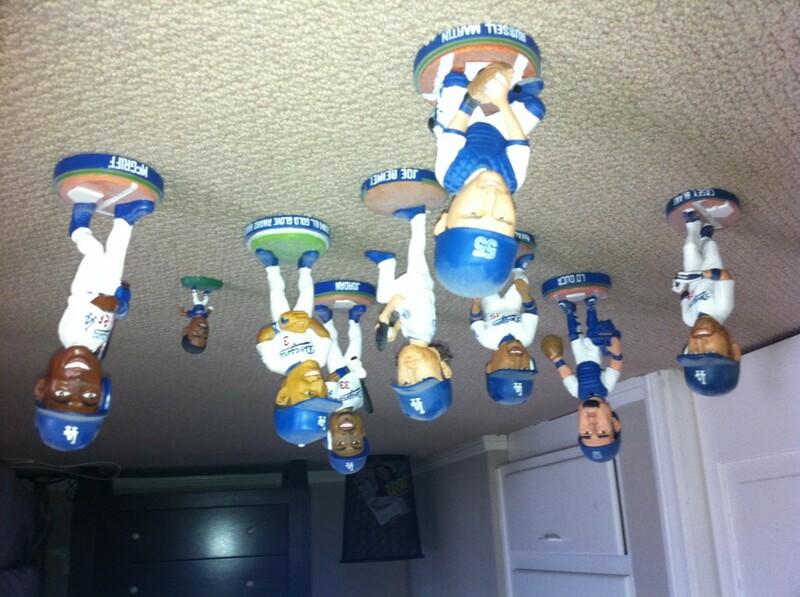 Hairston and Schumaker scored the Dodger runs. After playing .794 ball since June 22, the Dodgers’ magic number to clinch the National League West is 18, and they need to go 20-7 (.741) to reach 100 wins. 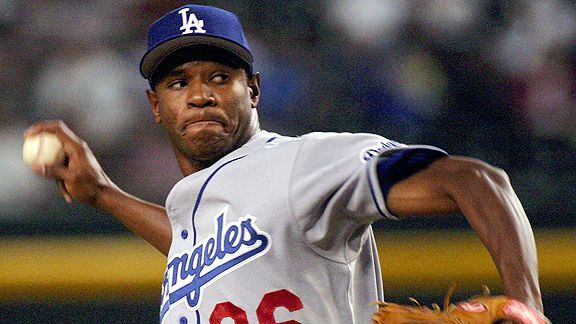 On the seventh anniversary of Jhonny Nunez-for-Marlon Anderson, the Dodgers have acquired 36-year-old third baseman and Covina native Michael Young from the Phillies, according to Ken Rosenthal of Fox Sports. What the Dodgers are giving up was not immediately announced. If Young is here to provide a bat off the bench, that’s fine. For example, Jerry Hairston has a .595 OPS this season. But the Dodgers don’t need to be weakening their starting defense now. Update: Jayson Stark of ESPN.com reports that the Dodgers will send a minor-league pitcher to Philadelphia, but no word yet on who it is. Update 2: It’s official – the Dodgers get Young and cash considerations ($1.7 million to cover his salary, according to Mark Saxon of ESPNLA.com) for 24-year-old minor-leaguer Rob Rasmussen, who has had a 2.55 ERA with 76 strikeouts against 91 baserunners in 81 1/3 innings for Double-A Chattanooga this year. He had a 6.46 ERA with 37 strikeouts against 99 baserunners in 54 1/3 innings for Triple-A Albuquerque. Padres at Dodgers, 6:10 p.m.
Tonight, I’m going to my first Dodger game since Memorial Day. That’s right: I have yet to see Yasiel Puig in person, yet to enjoy the Summer of Gorge anywhere but on my TV, radio or cellphone. This will be my fifth game of the year. When I got the tickets for my wife and me last week — and I’m not likely to go to more than one more regular-season game this year after this one — it occurred to me that this will be the fewest games I’ve attended in a Dodger season since … 1988. Read into that what you will. I’m reading in a lot of hope. That ’88 season began with me as a college junior, continuing through my trip to cover Stanford at the College World Series in Omaha, my summer internship at the Half Moon Bay Review & Pescadero Pebble and my late-summer job as a gofer for NBC’s Summer Olympics boxing coverage in Seoul. I saw not an inning of Orel Hershiser’s scoreless streak, and returned to the States a couple of days after my senior year began, stopping at LAX without venturing out of it. 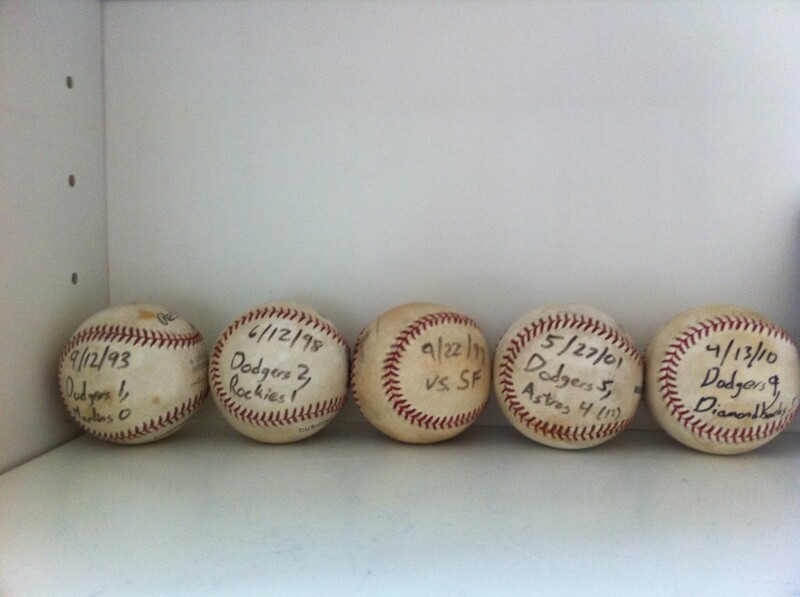 I had been at Dodger Stadium for Tim Leary’s pinch-hitting heroics, but otherwise my Dodger attendance that year was forcibly rare. I saw all the playoffs on TV in the vicinity of Palo Alto. I saw Mike Scioscia’s home run from the Stanford Daily newsroom, Kirk Gibson’s diving daytime catch and Jay Howell’s pine tar while ditching classes, Gibson’s homer off Eckersley with friends who were mainly rooting for Oakland, and the final out on my own little TV in my senior suite. It wasn’t a lifetime ago, but it kind of feels that way. By the same token, my last Dodger game in May — itself a bright spot countering a dreary start, in case you’ve forgotten — feels about half a lifetime ago. The team’s winning percentage when I’ve gone this year (3-1, .750) is still higher than it’s been in my absence (37-27, .578). Still, though my absence didn’t quite coincide with the surge, the Dodgers have gone 57-27 (.679) since I last attended. More than half the season has gone by. Peter O’Malley today said he has signed a licensing agreement enabling the Dodgers’ former Spring Training home, in recent years called the Vero Beach Sports Village, to be known as Historic Dodgertown – Vero Beach, Florida. In 2001, Indian River County purchased the land and buildings from the Dodgers, but since 2009, after the Dodgers moved their Spring Training to Arizona, the facility has been used for tournaments, camps and the like. A partnership including O’Malley, Hideo Nomo and Chan Ho Park saved the facility from extinction in 2012, even expanding facilities there. Their lease agreement with Indian River County runs through April 2019. 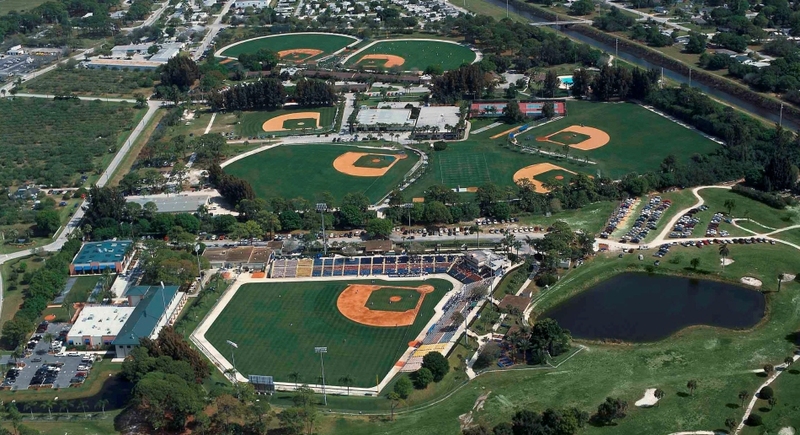 “We have plans for more ways to utilize this amazing facility year-round,”said Craig Callan, who arrived at Dodgertown in August 1978 to manage the sports and conference center, and now directs the day-to-day activities as Historic Dodgertown vice president. Edwin Jackson takes the mound at Dodger Stadium today, 9.97 years after his unforgettable Dodger debut on his 20th birthday against Randy Johnson in Arizona. So said Vin Scully about Edwin Jackson last night, and I couldn’t agree more. Especially because Vin was talking not only about Jackson’s pitching, but his smile. Call me a sentimental fool, but there is nothing like seeing a young baseball player thrilled. And to see that ballplayer balance his excitement with poise – that’s pretty much the pinnacle of enjoyment for me as a fan. If it weren’t for the television coverage and the 36,000 people in attendance, it would have been the same as watching a second-grader excel in the lead role of Tomato in the school play, Les Vegetables. Anyway, it was a night the most casual observer could appreciate. As I wrote in April, a large part of appreciating baseball is just understanding the characters in the movie. In his six innings against Arizona, Jackson allowed four hits, struck out four – and in a particularly amazing feat for a pitcher who walked or hit nearly four batters per nine innings in AA ball, he walked no one. The righthander threw 80 pitches, 49 for strikes. He did not throw many first-pitch strikes: 11 out of 22 batters faced. But on only three occasions did he reach a 2-0 count, and only once did he go to 3-0. In fact, he went to three balls on only three batters. He threw with heat – reports said he reached the high 90s – and movement. He had the requisite pitch tailing down and away that always foils batters like Raul Mondesi (who struck out twice against Jackson and once against Eric Gagne). Jackson also had a pitch that moved outside to inside on righthanded batters, almost like a screwball. With Andy Ashby following Brian Jordan on the disabled highway out of Los Angeles, speculation has arisen that the Dodgers would add Jackson to a potential postseason roster in the same manner that the Angels added Francisco Rodriquez last season. Don’t count on this happening. For one thing, the Dodgers seem very conscious of nurturing Jackson, and aware of the risks of stressing Jackson’s arm at age 20. 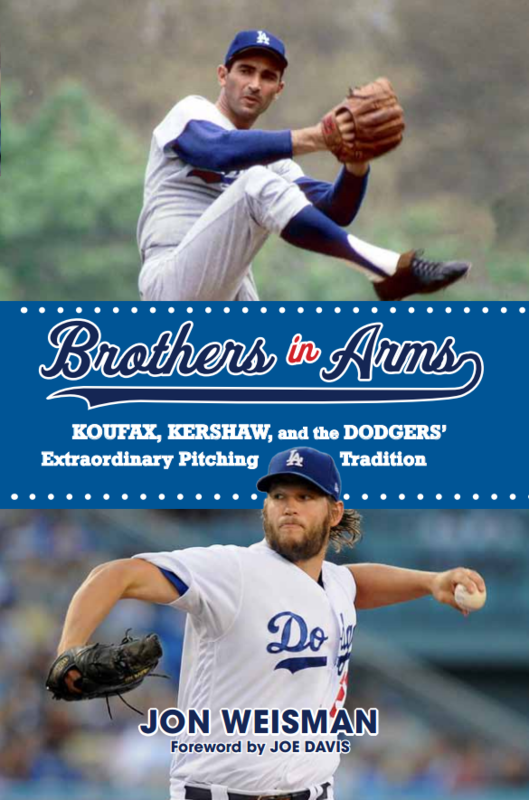 Additionally, the Dodger staff is deeper than the Angel staff was in 2002 – a guy like Steve Colyer, who throws hard and from the left side, seems like a more likely addition. And that’s assuming that the Dodgers even went with 11 pitchers in a postseason that has more off days than the regular season does. But with Hideo Nomo’s return date uncertain, and Kazuhisa Ishii’s September performance unsteady, there is every possibility that we haven’t seen the last of Edwin Jackson and his young man smile this season. Cubs at Dodgers, 12:10 p.m.
Because he’s Matt Freakin’ Kemp. Because even struggling through an injury-plagued season, even at his absolute worst, his 2013 OPS (.700) is almost as high as the Dodgers’ healthy outfielders in left (.755) and center (.762). Because in the 11 games he managed to play after his first stint on the disabled list in 2013, Kemp had a .390 on-base percentage and .622 slugging, with three home runs in his most recent 14 at-bats. Because even if he is never going to hit 39 homers in a season again, he’s still 13 months shy of his 30th birthday with the potential to hit as well as virtually any Dodger. Because he’s a guy who can do harm in the playoffs. Because he wants to prove himself. Because he wants to win. Matt Kemp is running the bases. Looked fine going from first to third. 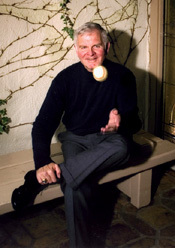 Former Dodger announcer Ross Porter, who hasn’t been part of the franchise since the McCourt regime sent him on his way after the 2004 season, said he will be throwing the ceremonial first pitch before Saturday’s game at Dodger Stadium. While taking on other broadcasting duties, Porter has focused his post-Dodger career on his website, Real Sports Heroes. He was an early friend of Dodger Thoughts, and it’ll be great for him back at the ballpark. Red Sox at Dodgers, 5:05 p.m. I can’t remember when the Dodgers hit into three double plays without the ball on any of them touching the ground. Luck was not their lady, today, but still Los Angeles made a game of it after falling behind 4-0 with one out in the first inning. Hyun-Jin Ryu was great except for that first frame, when he hit Shane Victorino with a barely inside pitch, allowed an infield single to Dustin Pedroia, an RBI single to Mike Napoli and the big blow, Jonny Gomes’ three-run home run. 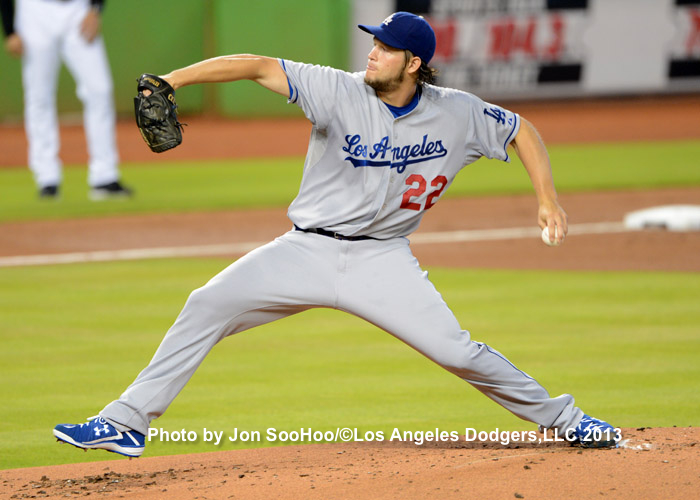 The runs ended the Dodger pitchers’ 26-inning scoreless streak. After that, Ryu and five Dodger relievers combined to shut out Boston over 8 2/3 innings on five hits and two walks with 13 strikeouts. Adrian Gonzalez had a two-run double in the bottom of the eighth, but after Hanley Ramirez walked to put the tying run on base, A.J. Ellis struck out against Red Sox closer Koji Uehara, making a rare venture into the eighth inning. Uehara, who had made 25 consecutive appearances in the ninth inning or later, retired the Dodgers in order in the final inning to finish the game. The Dodgers lost their fourth game in August and first at home. Red Sox at Dodgers, 1:05 p.m.
Clayton Kershaw has thrown exactly the same number of innings in 2013 that the Dodgers have thrown in August: 198 1/3. And the dominance for each is almost exactly the same. Provided by Baseball-Reference.com: View Original Table Generated 8/24/2013. The last pitcher to throw at least 300 innings with an ERA below 2.20 in a season was Jim Palmer in 1975.